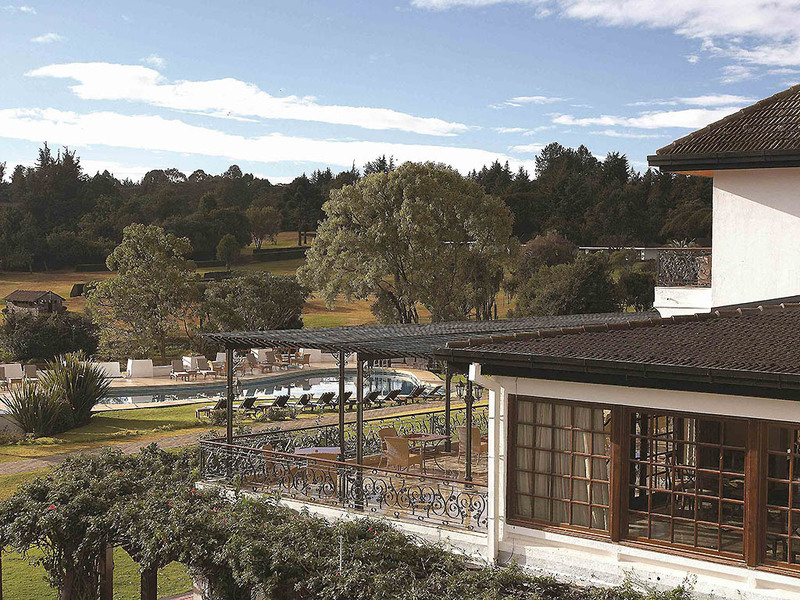 With magnificent views of majestic Mount Kenya, the Fairmont Mount Kenya Safari Club Resort's 120 luxuriously appointed hotel rooms, set in over 100 acres of landscaped gardens, offer a unique blend of comfort, relaxation and adventure. The hotel is the ideal base for a truly superb holiday in Nanyuki, Kenya. With some of the country's finest attractions on the doorstep, visitors to the resort can enjoy a various excursions and activities without spending hours and even days traveling between each. Located in the Mount Kenya Wildlife Conservancy; home to an animal orphanage, a game ranch teaming with wildlife and the only semi-wild, mountain Bongo breeding program, geared towards repopulating this endangered species back to their natural habitats. Guest rooms are spread out in the delightful grounds of the property. Accommodations are furnished with rugs - bedside lamps - dressing tables and built-in wardrobes as well as a wood-burning fireplace. Each bathroom has a 115 -240v shaving socket - toiletries - overhead showers and bathtubs - flush toilets - washbasin - hot and cold running water - water flasks and drinking water. All-day dinning facing the snow-capped Mount Kenya and overlooking the property's beautifully manicured ground. The signature restaurant boasts a menu abounding with the incredible variety of foods that are farmed in Central Kenya. Strategically located on the Equator where your server will cross from the southern to northern hemisphere to retrieve your order. Set around a wood-burning fireplace, this private dining location is accented with collection of photographs that feature actors and movie casts from yesteryear. The room has a working fire place, private terrace and spectacular views of Mount Kenya. Relax by the pool, while your waiter serves you a refreshing cocktail crafted by the Zebar. Liqueurs, soft drinks, cocktails, tea and coffee, as well as a snack menu are served from 10:00 am until 5:00 pm. In addition to offering a relaxed lounge atmosphere, Zebar, resting on the equator, is one of the few places in the world where your server will have to cross from the southern to the northern hemisphere to retrieve your order. Service was woeful - took a long time for anything to come and the service was never with a smile. Restaurant was terrible, food options very limited and often had run out. I had to stand at the drinks station for 10 minutes waiting for a glass which I asked for 3 different times. Coffee machine was broken and so filter was the only option throughout the entire hotel. Rooms were not clean - bath was full of small bits of rubbish. Toilet paper very poor quality. We paid to play golf on the worst course I have ever been on! Greens had sprinklers in the middle which were on, water had to be dodged whilst putting and the hose had to be avoided. There were no fairways and the grass from tee to green was so thick that the ball would be lost if not on the green. The design of the course is comical - trees throughout the course making most holes physically unplayable. Check out was farcical - we were told we had 20% off food, drinks and activities during our stay. Upon check out we were presented with a bill which was full price. We were then told that changing it would be incredibly difficult anmd my party had to wait for over an hour whilst the hotel worked out it’s errors. One of the best places to stay in Africa. Though it was a short stay for business purposes, I still got a little time to enjoy especially the ambience/atmosphere/environment. Only that during the welcome brief and at dinner, no one mentioned to me that the HB package I was booked on did not include drinks. So was charged an extra bill of 400/= for the glass of juice I ordered on the first night. MKSC was a beautiful setting for our family vacation and all the staff were so warm and welcoming! We want to thank all the staff, but especially Esther and Agnes, who went above and beyond to make our stay so memorable. The restaurant staff were also so accommodating -- and everyone encouraged our younger son's attempts to speak Swahili. Great location. Nice views. Very spacious. Many things to see and do. But not very well maintained and I could see how it degraded over time. Also, the food was not up to scratch. Very good rooms, but the food options while good, do not do the place justice. You need to up your game! Also, the idea of the fireplace is unmatched!! Very well done. Good service with lots to do on offer! simply awesome - a wonderful break from your usual hotel. Excellent from check in, plus wonderful grounds and amenities. Loved the bathtub and fire place. Plus my jog in the morning on the hotel grounds.